I was looking for a griff for awhile. I hadn’t found a breeder I felt comfortable with until I contacted George. He is very committed to doing right by his dogs in placing them as well as setting the new pup owners up for success. He is a wealth of information in training techniques. You can tell he really loves what he does. Now on to the pups. Ours, Huck, is very well mannered. He has been easy to train the basics and we are now working on refining his skills. He has a great nose and a soft mouth. He is ready to hunt ant time I am. Aside from that, he is also a great family dog. My wife was nervous about a pointer, as her experience had been they were very high strung. Huck is even tempered and well behaved. I know I will get another pup in the next few years and hope George will have a litter available. I was in the market for a griffon for 3 years before I made the commitment to buy my new pup. I used these three years searching for a strong pedigree and a breeder that shares the same drive I do when it comes to hunting and the unconditional love a dog provides a family with. George is that guy. I have the upmost respect for the hunting griff and their dedication to placing these pups with hunting families. These dogs were meant to hunt and have an incredible drive to do so. The pup I got from George (Flint), is 9 weeks old now. The natural ability of this pup at this age is incredible. His nose is one of the best noses I've ever seen on a dog. I haven't started any formal training because it is far too early but he has already tracked a pheasant wing to numerous hidden locations and instinctively given multiple sight and scent points. We have been doing 10-15 soft retrieves down a hallway since we got home and he is getting to the point where he searches for my hand now consistently. I have no doubt that Flint will be a brag dog in the field someday and can enthusiastically recommend George and his family as a breeder for Wirehaired Pointing Griffons. Couldn't have gotten a better breeder. George and his family have given me an awesome puppy, best friend and soon to be hunting partner. You will not meet a more passionate, responsible and knowledgeable breeder then George. This dog is extremely intelligent and I cant wait to start hunting with her. These are born and bred hunting dogs and I couldn't be happier with mine shes already catching on. 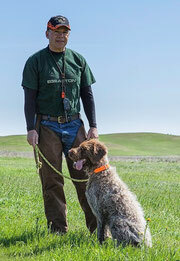 George DeCosta's knowledge and experience regarding versatile hunting dogs is surpassed only by his passion for Wirehaired Pointing Griffons and more specifically hunting griffs. After considerable research and waiting for the appropriate time to choose a new hunting dog, I chose to go with George for my new pup. George went above and beyond throughout the entire process, from breeder/new family interview and selection, to the follow up after receiving my new pup, he has been a joy to work with. 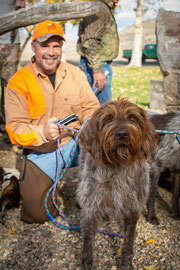 If you are serious about a well bred hunting dog, contact George DeCosta at the hunting griff. We got lucky and discovered The Hunting Griff/George about 8 months ago in our long search for the best WPG breeder around. We connected with several other breeders and there was NO ONE like George. When we found him, we knew right away he was the person we wanted to get our pup from, no matter how long it took. We just brought our little Murphy home 1 month ago from George's most recent litter of 10 pups (summer of 2016). George and his family are not just a breeder, they give their heart, soul, time and every ounce of energy they have to raising the most incredible puppies for people all over the US. Our little Murphy was already 85% potty trained, very well socialized with tons of people and birds, eating his food great, and literally the most loving little addition to our family. We have since spent time with George, his family and his WPG's - we feel so blessed to have met George and his family and even more blessed that our little Murphy spent some of his most important and formative weeks and months in George's care and home. Thank you, George! We are forever grateful to you for our amazing Griff! Murphy has changed our lives forever! 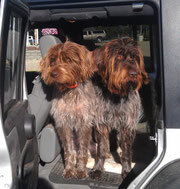 In my family there are 2 of George DeCosta's Wirehaired Pointing Griffons. The 2 year old female has the sweetest disposition and is loyal as can be. The new 3 month old puppy is no different. George is not a regular breeder, the time and effort that he puts into his litters shines through with his pups. He devotes his life to giving these dogs the best possible start in life. The early bird skills and swimming lessons are a wonderful bonus for these future hunters! The puppies are not only lucky to start their lives with George but they are also fully support by George's wife and sons. The puppies were so well socialized that we had zero problems introducing our pup from anyone from babies to the elderly. George DeCosta's skill as a trainer isn't limited to the Griffs. I am the owner of 2 spirited German Shorthaired Pointers Lebeau (m2 1/2, Tosca f10 mo. ), and as a first time hunter & hunting dog owner I was really overwhelmed by the training. My dogs come from the Hege Haus line of GSP's and they have amazing raw talent, but needed guidance. I had floundered through various trainers and AKC Junior Hunting events with Lebeau, and while he did achieve his JH, he had picked up the bad habit of pouncing on birds rather than holding a point. I felt that trying to change him was hopeless. While attending a NAVHDA event where my older pup Lebeau was running in the NA test, I had the pleasure of meeting George and Cota. I saw right away that Cota and George had a very unique connection characterized by mutual respect and affection. I told George about my problems with Lebeau's bird pouncing and we set up a series of training sessions to tackle the bad habits. You may or may not have ever experienced a dog training miracle, but let me assure you that with George's guidance, expertise and genuine love of the dogs, he took Lebeau from being a bird pouncer to becoming a truly finished dog who works the field, points, holds the point steady to flush and then retrieves to hand. He comes to a whistle command and heels like he's glued to your side. I can honestly say that with Georges training my pups, while still a work in progress, will now live up to their wonderful heritage of well trained and talented hunting dogs. A final note is how George really focuses on the relationship and bond you create with your dog. We all know the pleasure of having a dog - but the depth of relationship when you and your dog are connected by a genuine communication and shared experience is rare. With George's training and guidance I now have the opportunity to have this deep connection. It has been a distinct pleasure working with George DeCosta training my Griff, Josey. Though she comes from a different breeder (Whiskeytown Sporting Dogs), George has been very generous in sharing his years of experience, skills, and devotion to hunting dogs with us. As a result we achieved a NAVHDA NA P1 (110 points) this August. George has the rare ability to read dogs and tailor training for the dog's breed characteristics, individual temperament, and stage of development. During our training I've watched George working with Cota. They are a remarkable team. Cota is an amazing dog and what one can hope to aspire to with one's own dog. George has a love for dogs and deep insight about them. He loves dogs as much as anyone I've known and the dogs in turn love him. If my hands weren't already full with Josey I'd have my hat in the ring for one of George's future pups. George's big heart and generosity are reflected in his breeding program. Anyone getting one of these dogs or having the opportunity to train with him will be fortunate indeed. I met George while training for the NAVHDA invitational. He was a great training partner and provided me some excellent tips to work through some difficulties we were having. I saw first hand what a great dog Cota is. If you are thinking of getting a Griff or working with George on training, I highly recommend it. You won't be sorry. It has been an upmost privilege of having George Decosta as the breeder that our pup came from, and it was pure luck being a last minute family to be given one of these pups from Cota and Gus' first litter. From day one of having any interaction with George, it was and continues to be a superior experience. George is professional, responsive, experienced, knowledgable, and most importantly in our eyes, loving and kind and caring. He absolutely poured his heart and soul into this breeding, Cota and Gus and all puppies, like I imagine he will do with any and all future breedings. We made the 19 hour drive from Denver, CO to his home, where we were welcomed with a BBQ and drinks and a serenade by George himself, and were sent home with some delicious smoked salmon and the most magnificent pup. From the moment we got Einstein home, we was instinctive, smart, strong and stunningly confident. House breaking was a breeze, and he is mastering most basic commands at 5 and a half months. Watching him point out of pure instinct is thrilling, and he is absolutely tireless when it comes to retrieving. We can't wait to see how his upcoming training and natural ability test goes, but we have no doubt he will be awesome. Our one huge disappointment is that George does not live closer, as he is such a valuable resource in this entire process as a whole, and it goes without saying that he was a main tool in producing these top of the line pups, and last but not least, George is an overall great guy. After browsing the Web sites for about a year and a half, and contacting a number of breaders, I got a hols of George. He informed me that the litter was spoken for, but if I wanted I could be on the list for puppy number 10, assuming the litterms had 10. My son and I made the 4.5 hour drive up there to meet George and Cota, as well as Gus. George is a charming man who loves the Griffons bread. I own a German Shorthair Pointer and a Hungarian Visalia which I hunt qual,dove, duck and goose with. I told him the Visalia is getting older and I'm looking for a new dog to bring into my little pack. Being the Griffons lover he is, he had all the answers to all of my breed questions. And being the proud owner of one of the most behaved bird dogs I have ever had the pleasure of seeing, I new he was the breeder I wanted to deal with. The lucky day came for myself and my family when Cota had ten puppies and I got the call that we were getting a Griffon. The entire time, from the birth of our puppy to the pickup George was on top of every detail and informed the proud owners with constant email updates. I must say that our pickup day was bitter sweet, as George, being the caring man he is, got a bit chocked up prior to my son and I driving home with our puppy. It's my heart felt opinion that those of us who got puppies from George are blessed by the experience of having him as the breeder we delt with. We will be forever grateful to George and his family for enriching our lives by being the care givers of our new family member. My experience has been outstanding with George DeCosta. After speaking with many breeders about getting a Wire-haired Pointing Griffon, George @ The Hunting Griff was the obvious choice. George and I spoke for quite a while the first time in regards to getting a dog. He honestly cared about who and where his puppies were going. I was lucky enough to get one of the last pups available. The breeding happened several months later, and pick up was some time after that. During this time period, I received regular e-mails and updates in regards to everything related to the dogs. George kept us posted on Cota and Gus's NAVHDA testing along with vet exams before the breeding. Cota's pregnancy was well documented, and George monitored her very carefully the entire time. When the puppies were born there were constant updates and photos of the puppies. George's high level of training knowledge expanding over 30 years helped decide which pup was best for us. We drove from Tacoma, WA to the bay area in California to pick up our new addition to our family. The amount of care that George's family put into the care of the puppies in their home was exceptional. The whole family took park in raising these puppies until they were released to their new owners. My puppy was already socialized with people, kids, other animals, and she was somewhat potty trained. The best part is that the first day we got her home, she was not afraid of any noise (not gun shy by any means). She was also very birdy in regards to her interest in the scented bumper and grouse wing from the very beginning. I'm looking forward to years of training and field work with my new puppy. I can't thank George enough for choosing us as a family for one of his puppies. You will not find a Breeder with more care for his Dog and puppies than George @ The Hunting Griff. I had just lost a German Wirehair Pointer to cancer and started looking for a new dog when I found George. I contacted him through his website and he phoned me right away even though I live in Canada. We had a long and wonderful talk and I decided right then to wait as it turned out quite a few months for a new puppy. I am sure glad I waited and didn't rush out and get the first dog available. George and his family are first class people that love dogs and hunting them. I have just picked up a beautiful female Griff and already love her to death. I didn't get to come and see the litter so George asked me what I wanted in a dog and gave a choice of two. 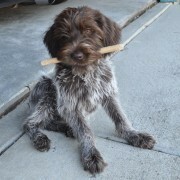 The one I picked has markings similar to my wirehair and she is a going concern just like he was. I just could not be happier. George and his family have been great to deal from the beginning of our journey to have a Griffon. I came across George when I started looking for a Griffon puppy. He has been amazing to deal with from start to finish. From the first introductive phone call I placed to George I knew he was a guy that was very passionate and loving about his Griffons. He kept us in the loop and advised of all of the details of the litter and selection. We even relied on him to evaluate and suggest what gender would be best for us. We looked forward to his weekly update son the puppies and their status. We even went to his house and he allowed us to visit with all of the puppies before we selected our little bundle of joy. Once you talk to George you realize he is a man with passion and integrity and loves his Griffon. It’s also great George helps our veterans with organizing hunts and giving a military discount. I absolutely recommend George and his family if you have any future plans of owning one of his puppies. Once you talk to him you will get the same sense of compassion, trust and love he has for the breed. I know my wife and I absolutely love our little Griffon.